What would it be like to be in a boat filled with animals for almost a year? Many of us don’t know what to do if we’re shut up in the house for a few days! The smell, the chores, and the tight space could’ve driven Noah’s family crazy. Instead they were probably so grateful that God spared their lives, they willingly made the most of a difficult situation. “I am going to put an end to all people, for the earth is filled with violence because of them. I am surely going to destroy both them and the earth” (Genesis 6:13). God doesn’t take sin lightly. Noah preached to the people and warned them about God’s anger. The earth was flooded killing all people and animals with the exception of those on the ark. Sin was the problem. To sin means to disobey God and be separated from Him. Sin steals the joy and peace in having a wonderful relationship with Jesus. You will need 2 chairs and a long, narrow piece of plywood. Set up the chairs so that they are facing each other. Explain to your class that one chair represents people and the other chair represents God. Share how God loves people, but He is holy and their sin separates them from Him. Take out the plywood and lay it across both chairs so that it forms a “bridge” between them. Discuss how God sent His Son, Jesus to die on the cross and how Jesus connects them to God when they ask Him into their hearts to be saved. God saw how Noah lived and shared with him the plans to flood the earth. God loved the people, but they loved their sin more. He won’t let people get away with doing the wrong thing—everyone will come face to face with the consequences of their sins. But there is hope! God loves every person so much that He sent His only Son, Jesus Christ to die for their sins. He took the punishment that everyone else deserved. Jesus did it for love. Play or sing the song “Jesus Loves Me” with your students. It would be most helpful and memorable to also teach it in sign language form. You can find many versions online on youtube.com with “Jesus Loves Me sign language song”. “This is how we know what love is: Jesus Christ laid down his life for us” (1 John 3:16). “But God remembered Noah and all the wild animals and the livestock that were with him in the ark, and he sent a wind over the earth, and the waters receded” (Genesis 8:1). 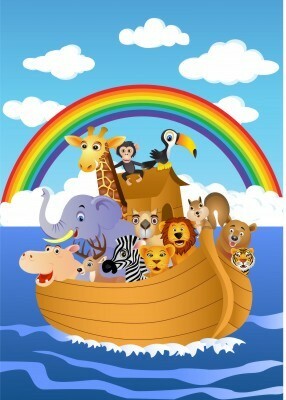 God protected Noah and his family in the ark. God protected Noah and his family in the ark. He kept the animal kingdom alive by sending them in pairs into the ark. God knows how to make everything work for the good of those who love Him even when they don’t understand it all. God sees everything and never forgets those who serve Him with all their hearts—He will make a way in His timing to fit His purposes. You will need cardboard, scissors, pencils, construction paper, people and animal shapes (perhaps from magazines or internet resources). Cut out a shape of the ark with cardboard. Your students will use the model to trace their own ark on the construction paper. Have the students cut out and paste people/animals to put on their ark. Remind them that God always remembers them through the good and bad days. “He remembered us in our low estate His love endures forever” (Psalm 136:23). “Whenever the rainbow appears in the clouds, I will see it and remember the everlasting covenant between God and all living creatures of every kind on the earth” (Genesis 9:16). Noah and his family needed reassurance that God wouldn’t flood the earth again. The Lord sent a rainbow as a sign of keeping His word to them and all creation. God isn’t man that He would ever tell a lie. He always keeps His promises, not just about the rainbow, but all of His promises in the Bible. You will need tortilla shells (cut in the shapes of rainbows), icing, and colorful pieces of candy (lemon, cherry, grape, orange, licorice). Make sure there is a tortilla shell for each student to put icing over and then allow for the students to place the candy in a colorful, but edible rainbow. Are you a “Noah”? Do you take the time to intercede and help others come to know God before the day of destruction? Remember that God frowns on our sins, God loves us, God remembers us, and God keeps His promises. Well done my friend. There is so much symbolism and imagery of salvation in Christ in this story that it is truly remarkable. You’ve done an outstanding job of connecting these. Here is something quite amazing. The word used for pitch in the Noah account is “kopher”, which comes from a verb rpk kapar meaning to cover. The meaning is obviously associated with the verb form, meaning to cover over, pacify, propitiate and atone for sin. Isn’t our God an awesome God!? Good idea for the CCD Class…………….